Oh boy, what a week. We've been really busy around these parts this last week, and it's not going to let up, with the next 2 weekends fully booked with photography jobs (and baby-sitting my nephew, I can't wait! ), not to mention working at my new job. New job? Yep, I forgot to mention the other week that I've just taken on a new casual gig helping out at a photography studio not too far from my house, The Good Egg Studio. The owner is a photographer himself and this year he'll be away shooting at each round of the Australian Rally Championship, so he needs someone reliable to be around and open the studio when there are bookings while he is away. It's the perfect job for me, as it's flexible, it's interesting, I can work it around the girls and school pick-up/drop-off, and I get to see professionals at work. Not to mention I benefit from the years of knowledge and experience my boss has had as a professional commercial photographer. He gets someone to hold the fort while he's away and help with the cleaning and maintaining of the studio, and I get to learn about the inner-workings of a studio and how he approaches his work and workflow. Winning! So anyway, with all of this going on I found myself seriously lacking in inspiration for this week's post. Thankfully, the amazing girls of Team IBOT have come to my rescue with a plethora of post ideas and prompts, and it's with much thanks I lay the inspiration for this post at our fearless IBOT founder Jess' feet. 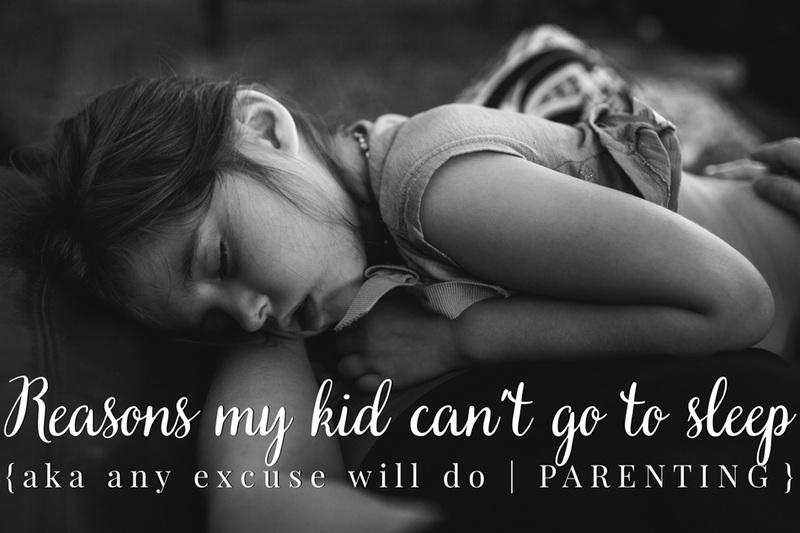 We all know kids are masters when it comes to excuses as to why they simply can not go to bed on time. Or to sleep. I've been lucky to be blessed with two beautiful children, one who loves sleep as much as her Mum (thanks Zee!) and one who could win a gold medal in Sleep Dodging if they ever turned it in to an Olympic Sport. Yeah, I'm looking at YOU, Punky! Punky has been in training for the Sleep Dodging Olympics since the day she was born, so most of these excuses have come straight from her mouth, with the exception of one from my sister, whch even 25 years later is still a classic. An oldie but a goodie, I don't think there's a parent alive who hasn't had their offspring say this to them, while either yawning, rubbing their eyes, or bouncing off the walls due to over-tiredness! "I'm too (insert any adjective here)!" Hot. Cold. Hungry. Thirsty. Itchy. Lazy. Sore. Sick. Lumpy. Pink. Busting to pee. The list goes on. And on. And ON! "I need to give Mummy a foot rub"
I wish this was an excuse from my sleep dodger, but alas, Jess is the lucky foot-rub-as-an-excuse-not-to-go-to-bed receiver. "I haven't finished my drawing!" Now this one actually did come from Zee, she is obsessed with drawing, and heaven help her if we try to make her go to bed when she hasn't finished her current masterpiece. It's about the only thing that would stop her from going to bed, because like I said earlier, that kid LOVES her sleep! "I'm too excited to go to bed!" This one usually gets pulled out on the big occasions, like Christmas Eve, the night before Easter Sunday and the Birthday Eve. Now I can totally understand that as an excuse on a night like Christmas Eve. I could never get to sleep on Christmas Eve, what kid could with all of that anticipation and excitement in the air. The imminent arrival of the man in the big red suit makes everyone excited. But we've had this one pulled out for such mundane future activities as grocery shopping, shoe shopping, watering the garden, cleaning the bathroom and going to the doctor's. Basically anything we're doing in the morning is cause for excitement so great that she couldn't possibly go to sleep! "It's too late to go to bed!" This classic line was pulled by my sister many years ago when we were being baby-sat by a teenage neighbour when Dad was away for work and Mum was at a meeting. Punky has also tried it on too (she is way too much like her Aunty!). My youngest sisters and brother were notorious for refusing bedtime, so when we yelled at her that she needed to get to bed because it was way past her bedtime and super late, her logical response was the above. Apparently there is a limitation on bedtimes, and once it's gets past a certain point it's just too late! Let's just say, it didn't work then, and it doesn't work now! In the immortal words of that work of literary genius, go the F%&K to sleep! What's the best excuse you've heard for not going to sleep?